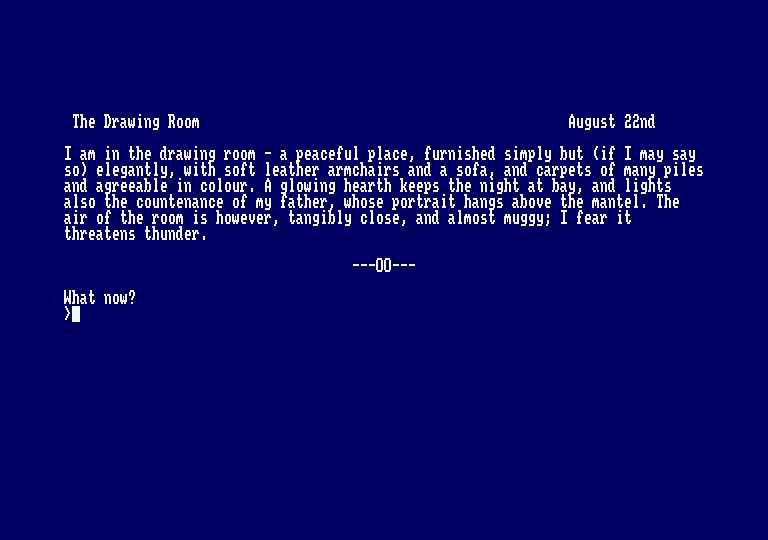 This game is another conversion to Amstrad format by Adventure Workshop. Once again the conversion has been affected using the Amstrad version of the PAW which means that, once more, unexpanded 464s aren't catered for. 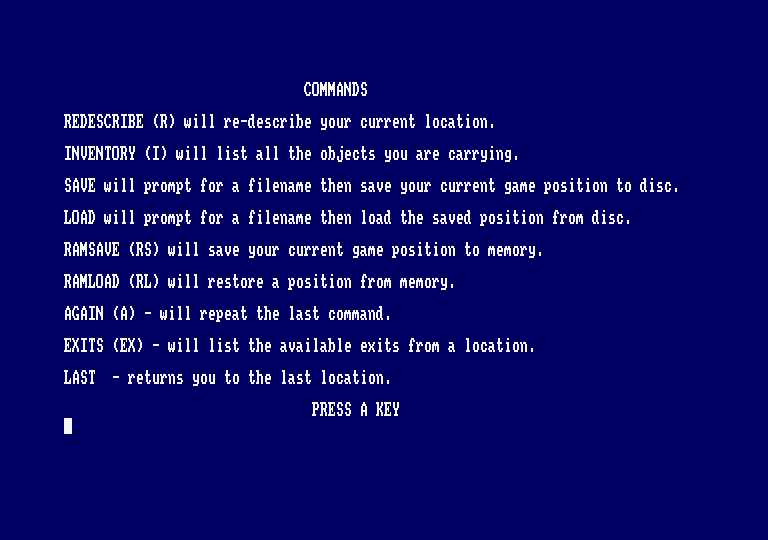 The game is available on disc only and runs under CPM. It does seem that tape users are being discriminated against, since most of the Adventure Workshop's conversions are PAW-based but they do have several tape-based adventures available. .Send a SAE for their catalogue. Dr. Jekyll and Mr. Hyde is, in places, a weird adventure and a difficult one. The whole game is played over three very different parts. Part One sees you within your house and laboratory, Part Two sees you roving around London and Part Three — the strangest of the three sections — sees you first in a surreal world, then in reality, then into another surreal dream sequence and finally, back to reality. Throughout all three parts, the language used is very atmospheric, adding volumes to the tension and realism of the game. The location descriptions are written in flowing, almost Victorian, English (reminding me strongly of Conan Doyle's writings) which complements the subject matter superbly. because the game is both difficult to solve and to find out what you have to do. 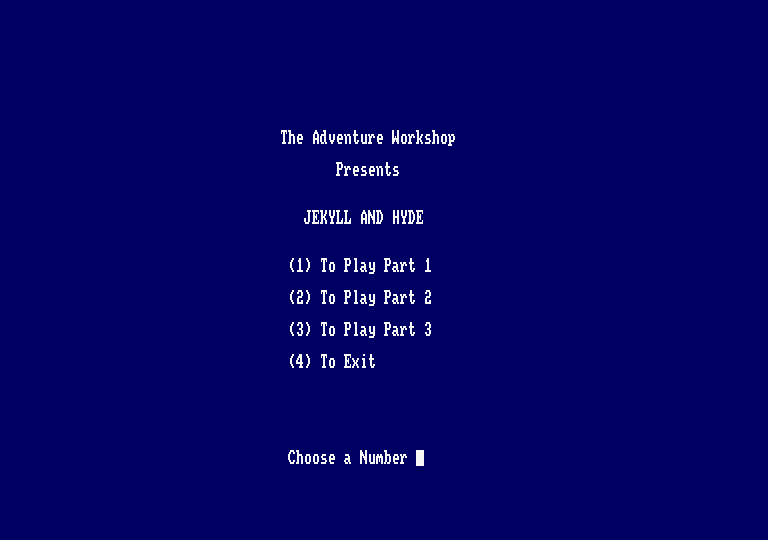 Part One of the game sees Dr. Jekyll in his house, tired out after his many experiments into the duality of man's nature. Yet Dr. Jekyll is looking forward to the next evening's dinner party. His friend, Dr. Lanyon, is bringing to Henry Jekyll some rare salts which are essential to creating the potion which will lead to the culmination of Jekyll's experiments. This is the objective of Part One — to make the potion which will enable the evil Dr. Hyde to emerge into the world and commit heinous acts. Now to create the potion you need three ingredients. Some Phosphorus, some rare crystalline salts (which Dr. Lanyon is set to provide you with) and some alcohol. No doubt you think that creating the potion is a relatively simply matter? Get/find the ingredients, then mix them up and drink the resultant nauseating brew. You can try it but you just might find that the potion doesn't, in fact, work. That Dr. Jekyll has failed in his life-long ambition of experimenting into the duality of mankind — or could it be that you have mixed the ingredients in the wrong order? Of course I'm assuming that you mange to obtain the ingredients in the first place. There are problems to overcome before you can obtain them. The Phosphorus is the easiest to deal with, so I won't give any hints for obtaining that. However, getting the salts from Dr. Lanyon might not be as easy as you first think. At the beginning of the game, I mentioned how tired Dr. Jekyll was after many long nights conducting his experiments. Well, it seems that your butler, Poole, is becoming concerned about the amount of time you are devoting to this project. This night, when you eventually fall asleep, you fall into the grip of a nightmare and awake screaming. Poole hears your screams and comes to the conclusion that the strain of the past months has become to great for you and that you are beginning to crack up. He confides his fears to Dr. Lanyon, who being a true friend, then refuses to give the rare salts to you, preventing you from making your attempt at mixing the potion. Having obtained the salts from Dr. Lanyon, you may well mix the potion only to discover that it still won't work. It could be that someone has been tampering with your alcohol. One of your domestics is, it seems, an alcoholic. Having pinched some alcohol, the bottle will be topped up with water but which will, of course, render the original alcohol useless for experimental purposes such as mixing a potion. There are, once again, two ways of getting around the problem that this presents. One is by keeping the strong stuff under lock and key — the other, well you'll have to find that out for yourselves. I'm certain that you don't want the entire solution presented to you. Once you have managed to concoct the potion correctly it will go through many changes and you have to drink it at the right point, so it's an idea to ramsave before mixing the potion. Given the choice, I'd prefer the ramload option every time. Having successfully drunk the potion you will be given the password to Part Two. Part Two is much more difficult than Part One. You must, as Jekyll, venture out and obtain safe lodgings for Hyde and then return and loose the monster of your creation. Out in Soho, Hyde will have trouble entering a club but will eventually manage it. Later in the evening he may win a great deal of money. Later, an insight into Hyde's ruthlessness is gained when he tramples a small girl underfoot. Part Two ends with Hyde having some trouble in turning back into Jekyll. Part Three of this saga is, as mentioned earlier, quite surreal in places, having two dream sequences to be negotiated. Here, I'm afraid you're on your own. The dream sequences are all yours! After the first dream you return to reality and to brutality as Hyde murders an old man. As Jekyll you will be questioned about Hyde and will feel another transformation about to occur. Outside the Police Station, the transformation takes place and you have to escape the police by utilising the sewers. Dr. Jekyll And Mr. Hyde is a really good adventure and a good conversion. The version which I played needed a little fine tuning but that will, 1 am assured, all be taken care of by the time you read this. For those adventurers who like atmospheric, challenging adventures this is the game for you.